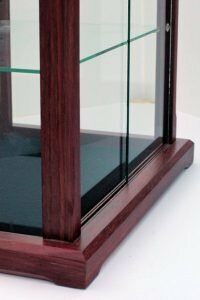 Home » Archive by Category "Exotic Wood"
This display case is handcrafted using solid Brazilian Cherry, but may be made to order in other domestic woods (see available wood options) . 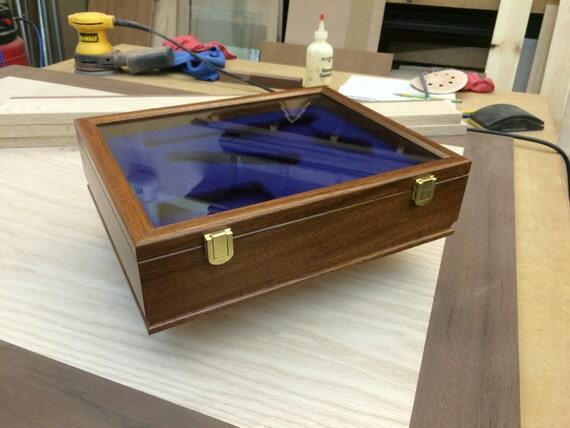 The case is solid 3/4 Brazilian Cherry with wood framed glass top to allow for easy access to your collectibles. The case design allows the contents to breathe while keeping them dust free. The Listed Price is for the Domestic Woods only — Add 15% for any of the Exotics. This case is Designed for a WWII German Luger – We can make the inner cutouts for any pistol. 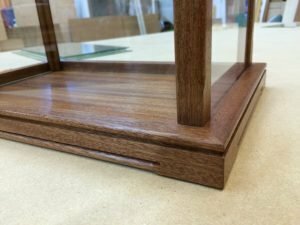 The outside dimensions of this case are 4″ tall by 12.5 wide and 11″ deep. 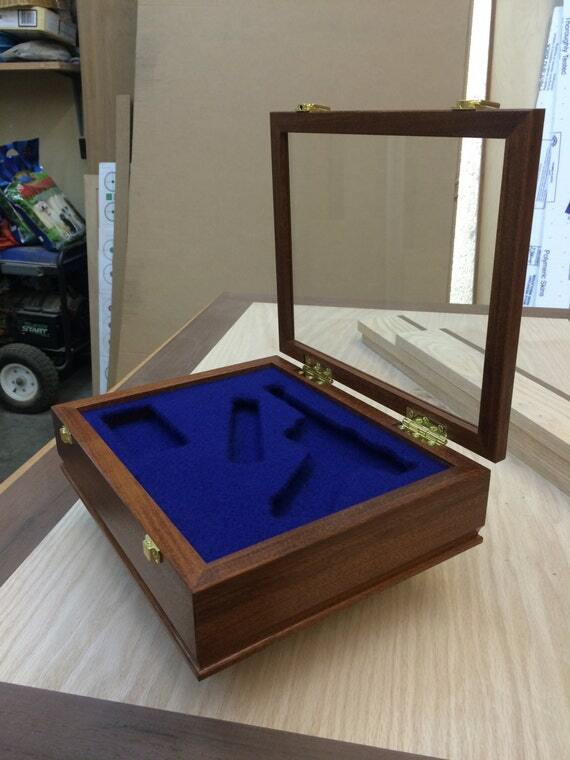 The inside dimensions of this case are 3.25″ tall by 11″ wide and 9.5″ deep. 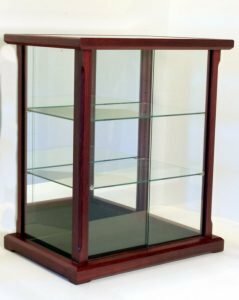 This display case is handcrafted using solid 3/4 inch Asian Merbau but may be made to order in other exotic woods (see available wood options) . The case has a mirrored back, glass top and sides, and solid glass front to allow for easy access to your collectables. The case design allows the contents to breathe while keeping them dust free. 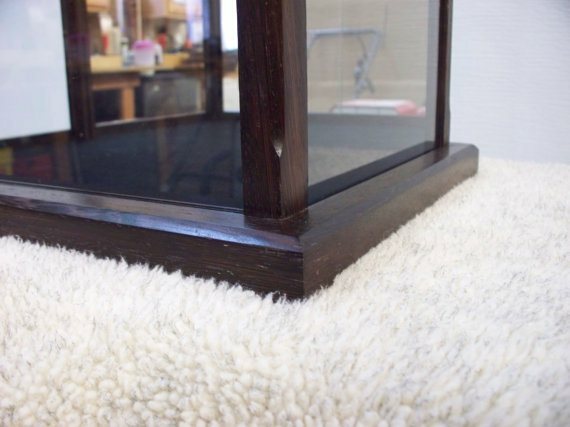 The bottom is a high quality black felt over 3/8″ Baltic birch plywood and has a Matching Mirrored Base!! 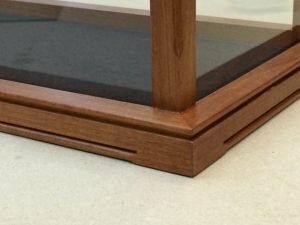 Mirror back can be added to the package for an additional $20.00 so you can have a choice of backs for different displays. 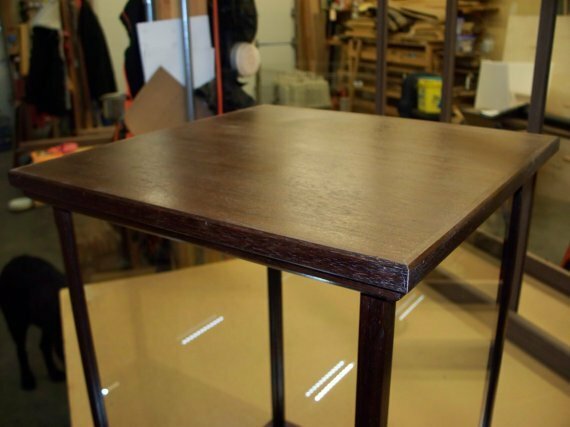 The outside dimensions of this case are 16″ tall by 18″ wide and 12″ deep. 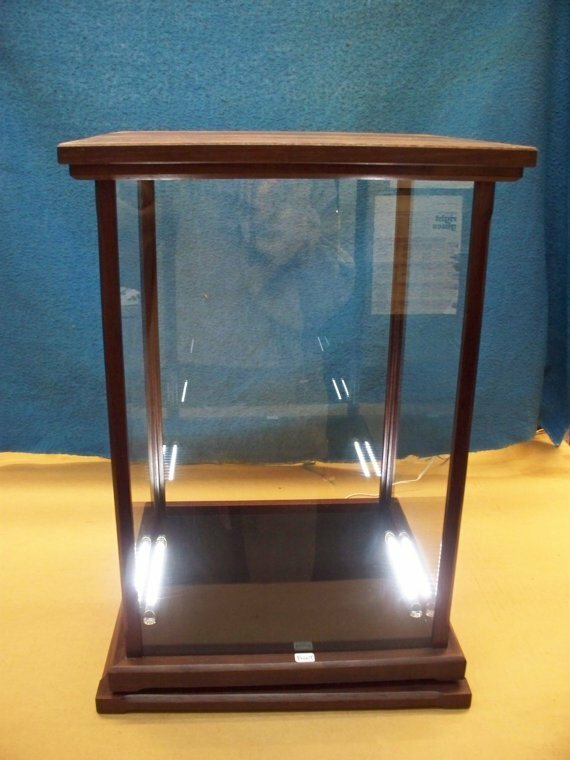 The inside dimensions of this case are 14.75″ tall by 16.25″ wide and 10.25″ deep. 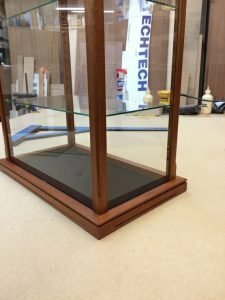 This display case is handcrafted using solid 3/4 inch Peruvian Walnut but may be made to order in other exotic woods (see variations for options) . 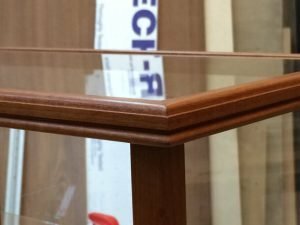 The case has a glass back, Solid Wood Top, glass sides and a glass front that slides out allow for clear viewing of your collectibles. The case design allows the contents to breathe while keeping them dust free. 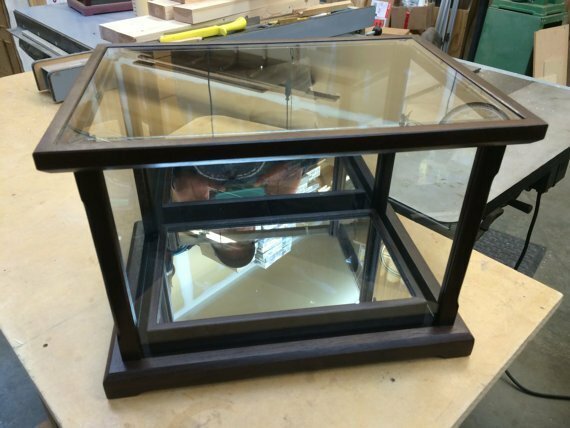 This case swivels on a lazy Susan design and is also lighted on both bottom sides. 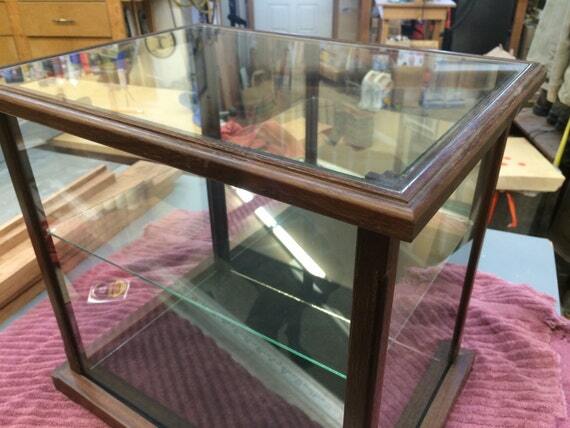 The outside dimensions of this case are 20″ tall by 14″ wide and 14″ deep. The inside dimensions of this case are 18.75″ tall by 12.25″ wide and 12.25″ deep. 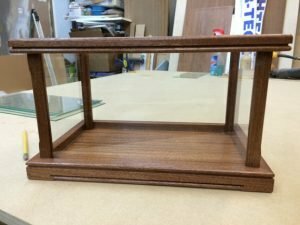 This display case is handcrafted using solid 3/4 inch Peruvian Walnut but may be made to order in other exotic woods (see variations for options) . The case has a mirrored back, two adjustable shelves, glass top and sides, and sliding glass front doors to allow for easy access to your collectables. The case design allows the contents to breathe while keeping them dust free. 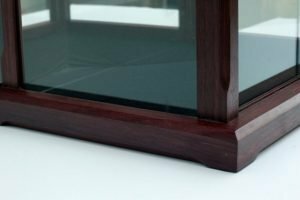 Clear glass back can be added to the package for an additional $20.00 so you can have a choice of backs for different display. 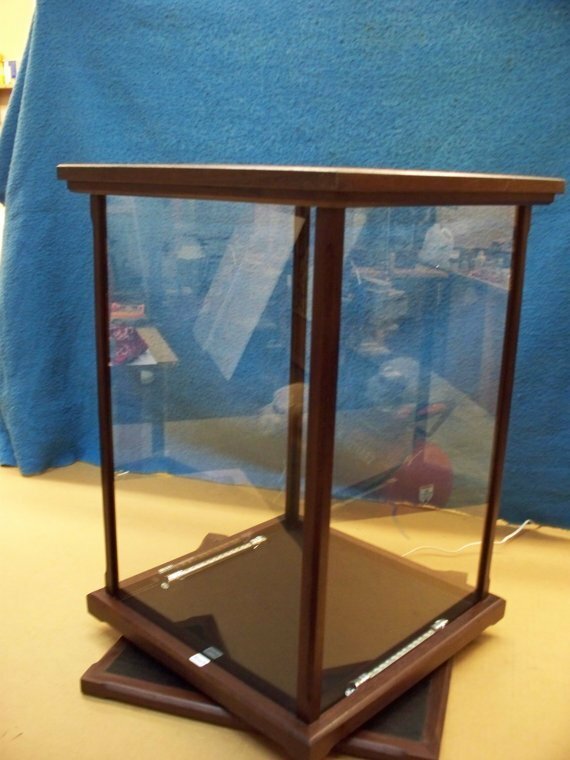 The outside dimensions of this case are 20″ tall by 16″ wide and 14″ deep. 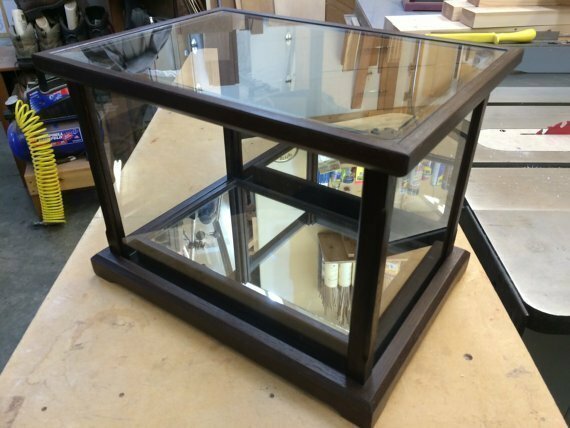 The inside dimensions of this case are 19.25″ tall by 14.5″ wide and 12.5″ deep. 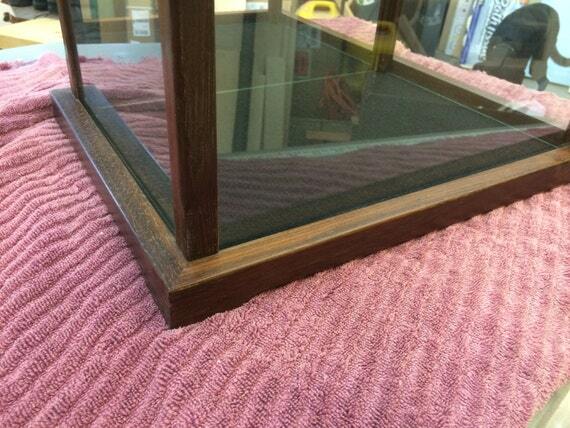 The outside dimensions of this case are 28″ tall by 17.25″ wide and 10″ deep. 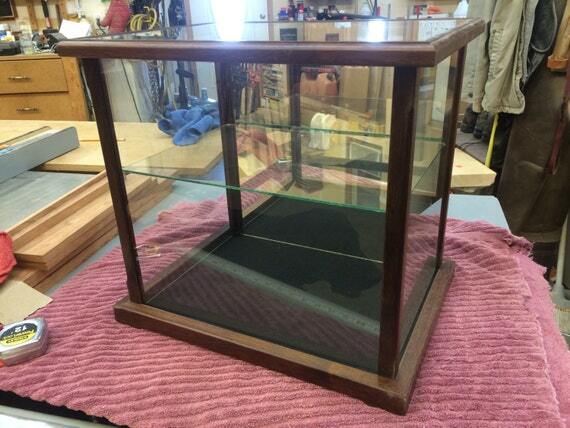 The inside dimensions of this case are 27.25″ tall by 15.75″ wide and 8.5″ deep. 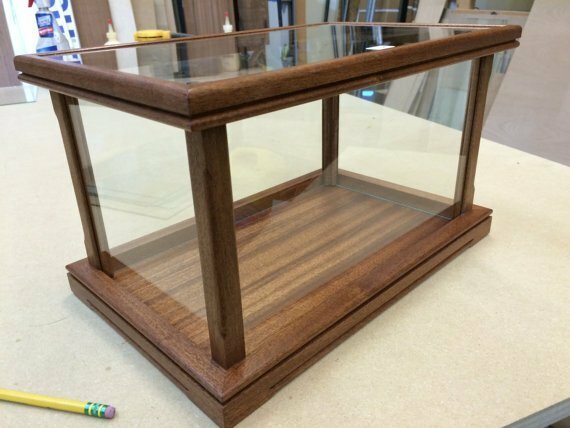 This display case is handcrafted using solid 3/4 inch Makore / Afican Cherry but may be made to order in other exotic woods. The case has a clear back, three adjustable shelves, glass top and sides, and a solid glass front to allow clear viewing of your collectibles. The case design allows the contents to breathe while keeping them dust free. 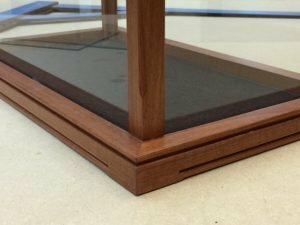 A mirrored back can be added to the package for an additional $20.00 so you can have a choice of backs for different displays. 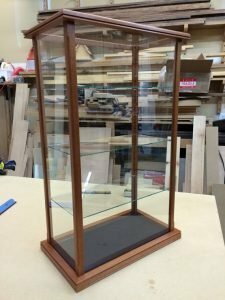 This display case is handcrafted using solid 3/4 inch Sapele / Mahogany Species but may be made to order in exotic woods (see variations for options) . 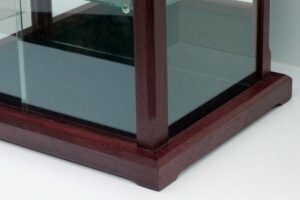 The case has a clear glass back, one adjustable shelf, glass top and sides, and solid glass front to allow for easy access to your collectables. The case design allows the contents to breathe while keeping them dust free. Mirrored back can be added to the package for an additional $20.00 so you can have a choice of backs for different displays. 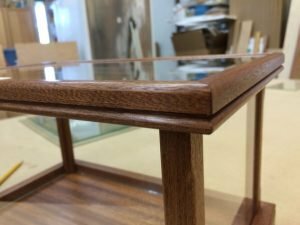 The outside dimensions of this case are 14″ tall by 16″ wide and 12″ deep. The inside dimensions of this case are 13.25″ tall by 14.5″ wide and 10.5″ deep. 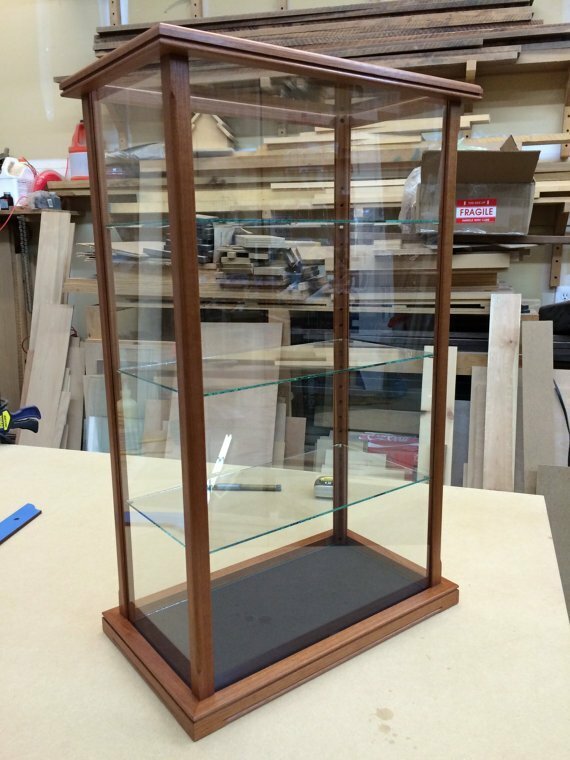 This display case is handcrafted using solid 3/4 inch Wenge but may be made to order in other exotic woods (see variations for options) . The case has a mirrored back, two adjustable shelves, glass top and sides, and sliding glass front doors to allow for easy access to your collectibles. The case design allows the contents to breathe while keeping them dust free. 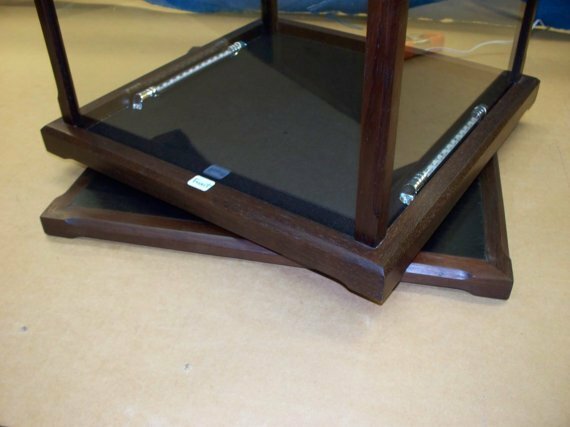 These cases can be quickly and effortlessly converted into several different configurations depending on your changing collectible needs — adding additional shelves, removing a shelf, you can even use it as a Doll Case by removing all the shelves and brass pins!